Melbourne, Florida —(December 18, 2013)— eWareness Inc., the nation’s leading, veteran owned web-centric marketing and technology agency and proud publisher of the Veteran Owned Business Project, announced that the company has recently been certified with the State of Florida’s Office of Supplier Diversity (OSD) as a service disabled veteran owned small business (SDVOSB). eWareness is the nation’s leading web-centric solutions provider focusing on web-centric marketing with a heavy emphasis on technology and design. eWareness has been helping businesses, government agencies and nonprofit organizations around the globe establish and maintain their online and traditional communications efforts while at the same time helping to significantly reduce marketing and technology budgetary expenditures since incorporating in 2002. eWareness is a certified SDVOSB with the VA’s CVE and with Florida’s Office of Supplier Diversity. More information about eWareness can be found by visiting their corporate website at: http://www.ewarenessinc.com or calling them toll free at (800) 517-4130.
eWareness is the proud publisher of the Veteran Owned Business Project (VOB). VeteranOwnedBusiness.com is a member-based network of nearly 20,000 businesses that are proudly owned by veterans and active duty military. Show your support for our armed forces by proudly searching for products and services that are all made by, sold by or serviced by United States military veterans! Well it's been a long year! We've seen a ton of activity internally and of course the country's seen a ton of activity from all angles. The new year is only a few days away. I for one am looking forward to many things in 2009 including a new administration to lead the country (hopefully in a much different direction) and a new outlook on the economy. I really don't see how we can do much worse. On a great note: we officially released VeteranOwnedBusiness.com on Veteran's Day 2008 (read our PR on the release of VeteranOwnedBusiness.com). It's been a little over a month and we have already crossed the 500 mark for business listings. We have several thousand pre-registered listings (signed up before VeteranOwnedBusiness.com went live). We have been contacting these businesses to resubmit their information. It's been a slow process but day-by-day things are increasing. 7) The addition of a "Why The Military Helped Me Become A Better Business Owner" quote area that runs throughout the site. This is a very aggressive plan to try and get many features added and working properly by the end of the first quarter of 2009. Soon (hopefully) we'll have a blog working directly on VeteranOwnedBusiness.com. When we do, I will begin to make post directly there. I hope and wish you all great success in 2009. Now more than ever is a time for fellow Americans to hope and pray for a better future. It's also imperative that we all search out and conduct business with other American owned businesses... or... as we have been working on: United States Military Vetearn Owned Businesses and Service Disabled Veteran Owned Businesses. Cheers and salutations in '09! Well we have finally signed up and later this morning will be exhibiting at our very first conference exclusively as VeteranOwnedBusiness.com. The signs came out great as did our show handouts. We will upload photos of the show in due time. If you are going to be at the show (8th Annual Veteran's Enterprise Conference at Brevard Community College in Central Florida) be sure to stop by our booth and say "hello". On other news, we have just hired a Jr. Web Developer who will be starting later on this morning as well. Things are still rocking along at eWareness. We've hired several additional staff members including our first, full time sales person. She is still learning the ropes but we are very excited to have somebody onboard full time to handle all the emails and phone calls. eWareness is excited to also have been recently listed on Website Magazine's list of Top 50 SEO firms. I'm sure this comes as no surprise for many of you who are clients and partners; however, the listing is causing use to receive even more leads than we normally get. 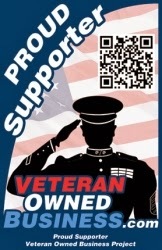 We are still plugging along with the VeteranOwnedBusiness.com project. Every day we get closer and closer to release into Beta. What has us very excited is we have crossed over the 1,000 mark of businesses that have pre-registered for their free listing. Well the Veteran Owned Business Directory is really starting to come along. Our character series is looking great. Please take a look at and let us know what you think about the characters. We are working around the clock (literally) to try to wrap up everything in time for the big Veteran Owned Business conference this Summer. Please... please... please: if you know of any veterans who own businesses or manage businesses. A listing on VeteranOwnedBusiness.com is totally free! It's now 2008 (actually has been for a week and a half). Things are rolling along as fast as ever. eWareness is making a fast track toward getting VeteranOwnedBusiness.com up and running and packed with Veteran Owned Businesses in time for several large Veteran Owned Business trade shows. We plan on exhibiting in Las Vegas this summer. With nearly 1,000 sign ups already, it's clearly apparent the VeteranOwnedBusiness.com Directory is shaping up to become the leading authority on businesses that are owned and/or managed by veterans and service disabled veterans. Other than that, we've been actively looking at areas in Charlotte for a second location for eWareness. Our office will remain headquartered in Melbourne Florida. With growing demand from businesses all over the United States, we've decided try and find an affordable, second location where the cost of living is a little lower than other parts of the country but with a large pool of talented employees. I'll update you more as the Charlotte issue comes along. Other than that, things are cooking. We've hired 1 full time web designer and one part time web designer. Both are settling in ok. I hope all is well and I wish you the best success in '08. Well the holidays are upon us. It's been an absolutely crazy year for me personally as well as the company I work for: eWareness. We've been going like gangbusters trying to finish up many huge projects before the end of the year and also keep up with the growing list of businesses all over the country looking to have eWareness help them online. We are also putting the finishing touches on the Veteran Owned Business Directory and hope to have that up and running very soon. Well I just wanted to take this time to with everyone a happy holiday season! © Copyright 2013 eWareness, Inc. All Rights Reserved . Awesome Inc. theme. Powered by Blogger.